This orchid forms part of the Ophrys argolica group and is sometimes simply referred to as Ophrys biscutella. Its scientific name refers to the 'mirror' on the lip which is in two parts or 'spots' that are sometimes joined in the middle resembling a pair of glasses - hence the English common name of Spectacled Ophrys. Identification is tricky since many other ophrys species, including Ophrys bertolonii, can have two shields on their lips so it is advisable to look for some of the other features (described below) in order to have some degree of optimism that you have got it right. Known only from southern Italy Ophrys biscutella can easily be confused with many other ophrys orchids that have similar markings on their flower lips. The main difference is that the lip of O. biscutella is a universal dark brown and velvety looking, resembling that of O. fuciflora rather than other species that have paler margins - O. tenthredinifera, for instance. The plant is robust, growing up to 50cm and each infloresence carries between 2 - 10 large flowers. 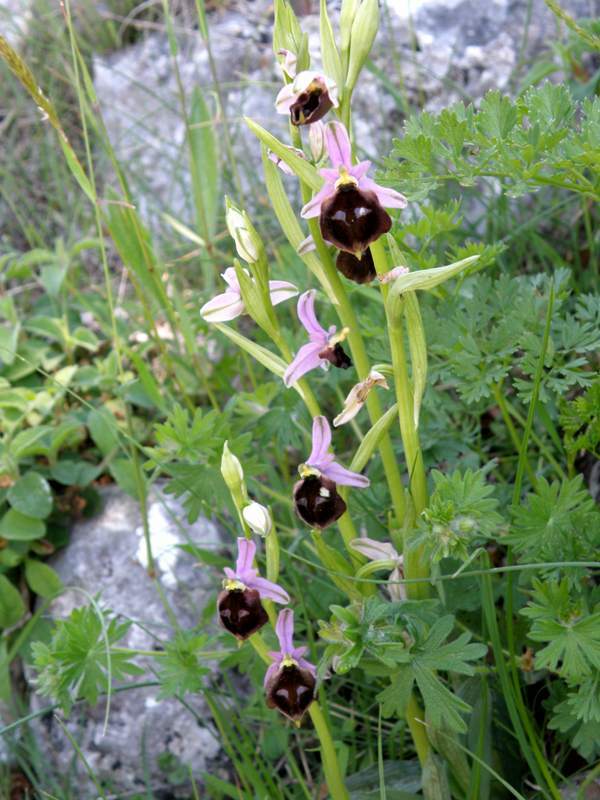 Known only from Italy, the distribution of this orchid is localised but it is sometimes found in large colonies. 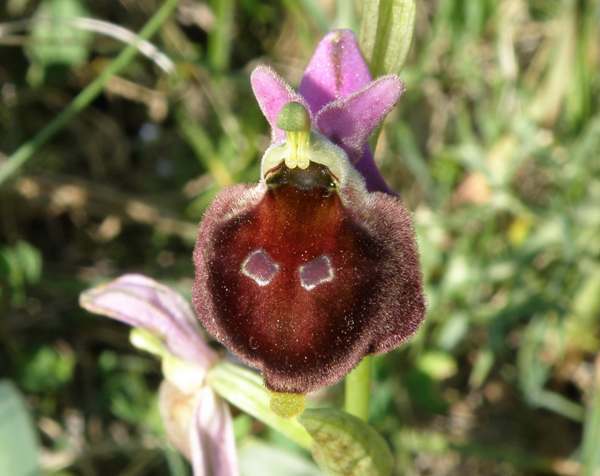 Ophrys biscutella is tolerant of more than one kind of habitat. We found it not only in open dry grassland and rocky places but also on the moist and semi-shaded edges of woodland. This orchid flowers from the beginning of April through to the end of May. This specimens shown on this page were photographed near Monte Sant'Angelo (top) and Foresta Umbra (bottom) on the Gargano Peninsula, Italy, in mid April.